My young kids see me craft a lot and they like to get in on it as well. However, I obviously can't let them do everything I'm doing. "Yeah, grab that steaming glue gun. Sure you can paint the walls like Mommy! Want to try the sewing machine?" It just doesn't work that way. And sometimes it can even be hard to let go of my inner-control freak and let them do things the way they want to. Anyone with me? Yes? 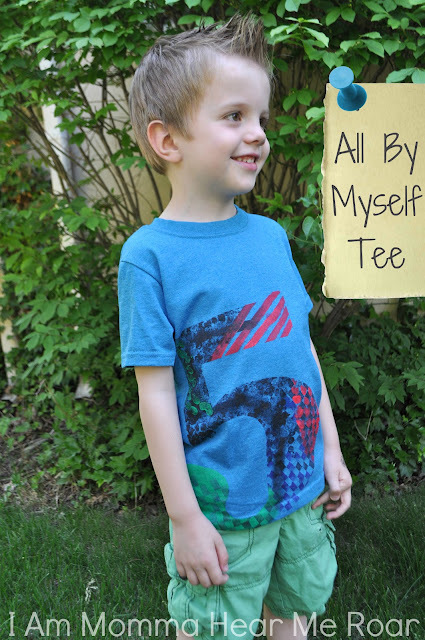 Okay, so here's the perfect project to let little ones do with you or all by themselves. Why? Because you can't mess this t-shirt up. It's meant to look messy. I ironed the paper on. 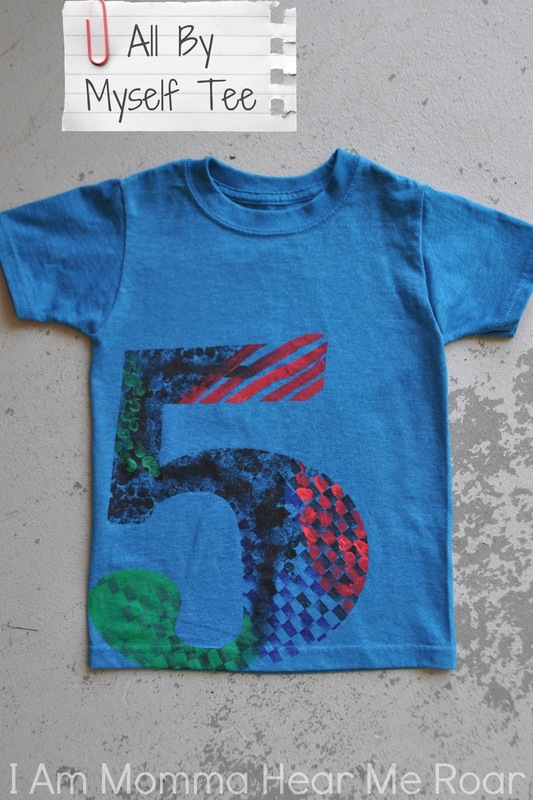 (Video tutorial for freezer paper stenciling HERE.) Then I got out my Tulip fabric paint and my big phat fabric markers. I also got out some bubble wrap to use like a stamp. I let my son and his cute cousin go for it and I joined in too. It was pretty fun. We used these big phat markers like stamps to get a checkered pattern. My nephew filled in the holes with red paint, which I thought ended up looking really cool. Here's what it looked like when we were done painting it. My favorite part is always removing the freezer paper stenciling. You can see the bubble wrap stamping, the checkered pattern of stamping the markers, and a lot of random painting on the shirt. So if your kids are out of school and looking for a project, cut a stencil and let them go for it.